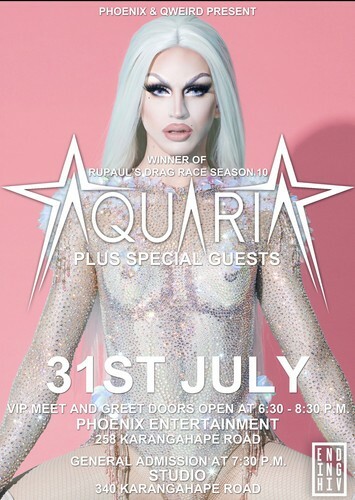 Straight off the heels from the grand finale of Rupaul's Drag Race and Season 10 Winner - Aquaria will be heading to Auckland for one night in a club style show. Performing and doing a meet and greet. VIP Meet & Greet Experience from 6.30-8.30 at Phoenix Entertainment, 258 Karangahape Rd - This ticket includes the main show, mock or cocktail on arrival, platters of food, photo booth area with professional photographer & more. Following the meet and greet, you will be escorted down to Studio by a drag queen for the main show. General Admission Main Show - Doors Open 7.30. Finishing around 11.30. There will be a line up of local drag talent to get you in the mood and music by Campy DJ Steven Oates. Your hosts for the evening Dame Buckwheat & Miss Tess Tickle. This is an R18 event, however those 16 yrs and over are allowed accompanied by a parent or legal guardian. Note: this event was previously listed at Phoenix Entertainment, 258 Karangahape Rd but is now located at Studio, 340 Karangahape Rd.